A gorgeous Hermes vintage stirrup gold bracelet depicting the iconic stirrup motif in four delicate sections. 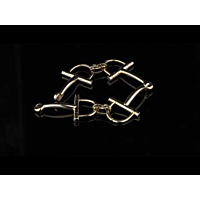 Crafted in solid 18k yellow gold, two pairs of gold stirrup links, artistically connected by a tiny gold "strap," are linked together in the center. 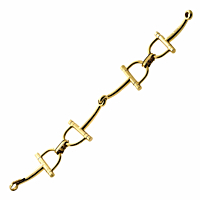 The Stirrup Gold Bracelet is finished with a invisible spring loaded closed clasp.